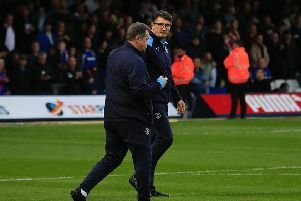 Hatters interim boss Mick Harford confirmed the club are still looking to strengthen their attacking options after Elliot Lee sat out the 4-0 win over Peterborough on Saturday with a hamstring injury. The 24-year-old, who has found the net 10 times this term, wasn't in the starting line-up for a league game for the first time since the 4-1 win over Accrington on October 23. With Danny Hylton suspended for two more games and Harry Cornick only just back in full training, it meant Town had players on the sidelines who had contributed 20 league goals so far. Although the 11 chosen showed it mattered little, with James Collins bagging a hat-trick and Luke Berry on target, Harford who signed George Moncur on a permanent deal last week, with George Thorne arriving earlier in the window too, said: "We keep looking, we are a progressive club and we are short up top. "We will be looking and see where we are in the market before the window closes, definitely, but we’re not close to anything yet." “Elliot just felt a bit stiff in his calf and hamstring and we just didn’t want to risk him, but he’s fine. "Thankfully the lads who stepped in did well and that’s why we have a squad who have gone on and got a great victory." Meanwhile, when asked if he felt the club needed strengthening upfront, striker Collins, who is now on 14 for the season, added: "That’s not my decision. "The main aim of the season is to get promoted, the more players we can get on board to help us do that, then so be it."